The materials upon which this book is based have been collected from a wide range of sources and represent the observation and reflection of men who have seen life from very different points of view. This was necessary in order to bring into the perspective of a single volume the whole wide range of social organization and human life which is the subject-matter of a science of society. 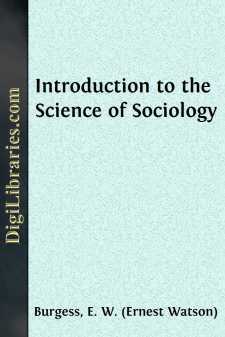 The Introduction to the Science of Sociology is not conceived as a mere collection of materials, however, but as a systematic treatise. On the other hand, the excerpts which make up the body of the book are not to be regarded as mere illustrations. In the context in which they appear, and with the headings which indicate their place in the volume, they should enable the student to formulate for himself the principles involved. An experience of some years, during which this book has been in preparation, has demonstrated the value to the teacher of a body of materials that are interesting in themselves and that appeal to the experience of the student. If students are invited to take an active part in the task of interpretation of the text, if they are encouraged to use the references in order to extend their knowledge of the subject-matter and to check and supplement classroom discussion by their personal observation, their whole attitude becomes active rather than passive. Students gain in this way a sense of dealing at first hand with a subject-matter that is alive and with a science that is in the making. Under these conditions sociology becomes a common enterprise in which all members of the class participate; to which, by their observation and investigation, they can and should make contributions. The first thing that students in sociology need to learn is to observe and record their own observations; to read, and then to select and record the materials which are the fruits of their readings; to organize and use, in short, their own experience. The whole organization of this volume may be taken as an illustration of a method, at once tentative and experimental, for the collection, classification, and interpretation of materials, and should be used by students from the very outset in all their reading and study.